Farewells & Comments from Amazing Mexico! It’s always sad to say goodbye to people after being with them 9 or 10 days. This pilgrimage through Mexico went flawlessly. We emphasized Guadalupe and the Catholic heritage of this land but also the cultural, historical, and fun aspects. We enjoyed the close contact and fellowship with the Mexican people . 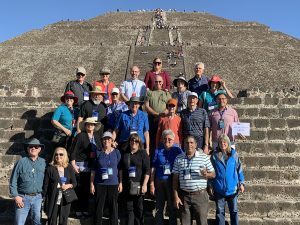 Everyone had a great time and the fears that Americans tend to have, and the preconceived ideas of what Mexico is like, were all blown to pieces. Mexico is a beautiful, safe, clean and Catholic country. Here are the comments and thoughts as shared by the pilgrims. Looks like I missed a fantastic opportunity. Still this time or year is tough to get away. Glad all the pilgrims had a great experience. God bless all. Next post: Is the Mass a Sacrifice?